Hear Ye!-Hear Ye! 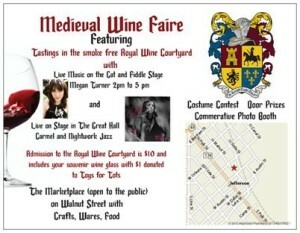 Come one come all to the first Medieval Wine Faire in Jefferson Texas. September 29, 2012 starting at 2PM continuing to 10PM. The Marketplace on Walnut Street containing items such as unique wares, books and more is open to the public 2 to 9PM. 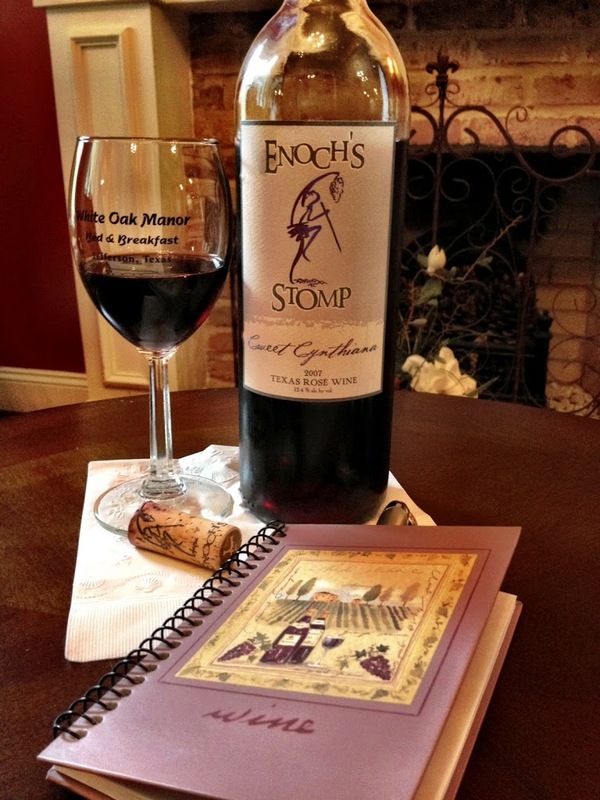 The Royal Wine Courtyard under the big tent will be featuring five Texas wineries; Los Pinos Ranch Vineyards, Enoch’s Stomp Winery and Vineyards, Tara Vineyard and Winery, Enchanted Manor Winery and Meadery and Maydelle Country Wines. With your souvenir wine glasses you can try and decide the best wines that tickle your taste buds. Performing on the “Cat and Fiddle Stage” Megan Turner 2 to 4:30 PM. The Bilge Pumps as the Singing Pirates 5 to 7PM. The “Lionheart Stage” offers Wine Seminars, Live Music and Comedy. The Redneck Wine Snob takes the stage from 2:30 to 2:45PM and again from 4:30 to 4:45PM. Winery seminars from 2:50 to 4:25PM. And then finish the evening with a performance from Lady Carmel and the Nightwork Jazz band from 7 to 10PM. In the main lobby of the Theater a photo booth will be set up to take your event pictures all day. Don’t forget to stop by so you can take home a fabulous picture commemorating your day at the Jefferson Texas Medieval Wine Faire. $10 gets you into all of it and into the wineries in The Royal Wine Courtyard plus the first 2000 visitors get a souvenir wine glass!! Shop, eat and listen while you taste the wine! Come in costume for contest! Since the day’s events are all about wine and wine tasting we will be giving all the guests who stay at our East Texas bed and breakfast a complimentary wine tasting journal so you can take home a little reminder of your favorites and continue to fill it in when you next enjoy a winery, vineyard or wine tasting.